This free focus on close reading resource helps you teach students how to differentiate and form thick and thin questions. As you work to incorporate the skill of Close Reading into your daily classroom routine, you will find our set of free Close Reading materials a helpful tool. This specific post focuses on the skill of teaching students to differentiate between thick and thin questions. They will learn about the difference. They will be encouraged to develop their own questions to fit within these two categories. This is the first in a series of posts designed to provide resources for Close Reading instruction in the classroom. The goal of these printables is to help children begin to learn how to differentiate between thick and thin questions. Students will then learn how to ask deeper questions. An important part of self-monitoring is asking questions while reading. Often, it can be difficult for students to determine how to ask meaningful questions. We like to help students understand how questions can differ by referring to them as thick or thin questions. Once students understand the difference, they can be encouraged to form questions that dig deeper into the text. Anchor Chart – We have provided this anchor chart in color and in black and white. Mini Anchor Charts – These can be placed at a center for a reference or glued into interactive reading notebooks. Again, we are providing these anchor charts in color as well as in black and white. Thick or Thin Card Sort – These cards can have a variety of uses in your room. You may choose to begin by using it during a mini-lesson and ask the class to work together to sort each question into the correct category. The cards could also be used as prompts for students developing their own questions. Or, the cards could be used during a literacy club as a way to guide questioning. 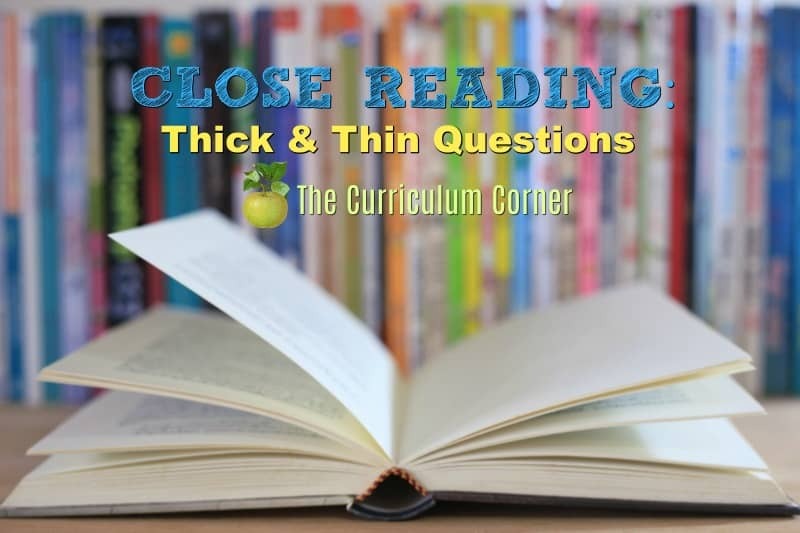 Thick or Thin Questions Practice Page – Before students can be expected to ask questions in their head to self-monitor while reading, they must be given many opportunities to practice this skill. We have created this graphic organizer as an exit slip to be used in your classroom. We suggest first modeling during a mini-lesson. The next day we would repeat the activity while asking students to have more input in the formation of questions. When students are ready, assign this page as a task during independent reading, reviewing answers during group share time at the end of class. 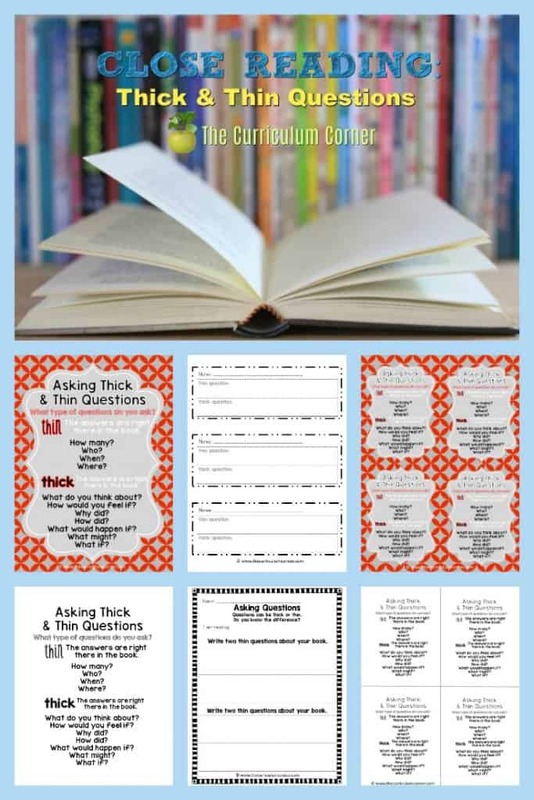 Thick or Thin Questions Bookmark Exit Tickets – Use these when you want to do a quick check. Students are asked to record one thick and one thin question. There are so many ideas out there for teaching this concept. What about using the game Heto give students practice? We also found a picture of a class activity where a teacher had students record thick questions on regular size post-it notes and thin questions on the mini post-it tabs. What a great visual! Do you have other ideas? We would love to hear them! This is a part of our series on Close Reading. If you are looking for additional free resources, please visit our Complete Close Reading Collection. I enjoyed all the ideas, and will be using them with my class. Thanks! Thanks, I love it all! Two great books that are great for thin and thick questions are Smoky Night by Eve Bunting and Terrible Things by Eve Bunting. Great Books! Thanks, this really helps students to understand the difference between simple and complex questions. Good idea.